Camping! Girls really benefit from the experience! It gives them opportunities to get outdoors, connect with nature, build friendships, practice teamwork and learn technical skills. Why not take your Unit camping this year? Camp “MAC” – your campsite – owned and managed by members of Fraser Skies Area, is located on Sumas Mountain east of Abbotsford. It is a favorite place for all who get the chance to camp there. Camp McLanlin provides two residential sites, one camping site with cabins, one camping site with platform tents, and one semi-wilderness site. Ponder Park (25199 76th Avenue) is an 80 acre nature reserve in Langley, owned by Langley Township and cared for by Langley Scouting & some Guiding groups. The lease runs from January, 1974 to January, 2024. For more information on Ponder Park, booking procedures and costs, please check out the Nicomekl Scouting webpage. This ‘back to basics’ outdoor camp is sponsored by the BC Council of Girl Guides of Canada. Girls will be camping together in Northern BC! Up to 2500 participants from BC, Canada and International visitors are anticipated. For more information, view the SOAR 2017 website. View Fraser Skies SOAR 2017 Facebook Page Here. For Fraser Skies Guiding Members ONLY. Check out the OAL Camping Guide! 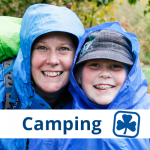 Participate in the BC Camping Challenge. 100+ Things to Do at Camp!